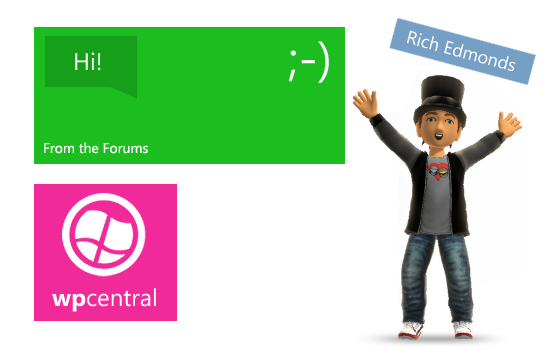 While we patiently move ever closer to Microsoft's Windows 8 and Windows Phone 8 events, our readers will have better luck at the Windows Phone Central community forum with the Windows Phone news temporarily dried up. What has been happening over the weekend, discussion wise? It's time for another From the Forums - *cue badass theme tune*. We're first looking at Microsoft's upcoming events, that are so close, yet so far away. The long wait causes even the most patient of consumers to become insane with the mix of emotions. Did Microsoft and OEMs announce upcoming hardware too early, or are we all just thinking negatively through the incredible amount of tension? The longer I wait for Microsoft event the less I get excited about the devices ... When they presented the ATIV s and the Lumia 920 I was excited because they are awesome devices! I was ready to buy the first WP8 device available in Canada. Then, there is that hole in time where nothing about Windows Phone is happening, the wait is long and the excitement is decreasing. I feel like the momentum that was built is falling apart. Forum member Simon Tupper has created a thread to discuss the possibility that Microsoft actually made the wrong move to leap ahead of Apple. But with the Apollo launch just over a week away, we can't help but think the hype will be back on track right before the event. With so much riding on Windows Phone, Microsoft wouldn't allow the platform to begin to drop before it's unveiled. Then again, we could be wrong. What are your thoughts on how we're progressing towards the 29th? Be sure to head on over to the "Microsoft event and the excitement?" thread to join in the discussion. Which phone are you going for? It's a tough decision to make for many. HTC has announce some new, colourful hardware, while Nokia has gone into attack mode with innovative features. Samsung has remained true to the company's smartphone development by offering a device fit to be the successor of the Focus family of Windows Phones. "Not getting anything at launch. Just gonna sit back and see how WP8 plays out. Still have some questions about the OS in general, even though I'm very excited about it (mainly the multitasking). Plus, I also have that dilemma of if I wanna buy the 920 outright and bring it to T-Mobile, upgrade to the 8x, or sit and wait until my contract expires in February and contemplate moving to Verizon or AT&T." As mentioned above, it's a difficult decision, which phone does one go for? The handset with a more appealing design or the one with more advanced specifications? Jump into action in the "Which phone are you going to get on launch day?" thread, cast your vote and deploy your opinions.